I find the iridescence of Mother of Pearl simply irresistible. The original design as seen in the 3D CAD model had a stainless-steel Cycfi logo. Well, chrome and stainless steel is classy, no doubt about that. The 3D rendering is indeed gorgeous. Nevertheless, it can’t compare to Mother of Pearl. So now, I am starting to deviate from the original plan. The logo will be inlaid Mother of Pearl. The original design also had simple triangular LED fret markers. 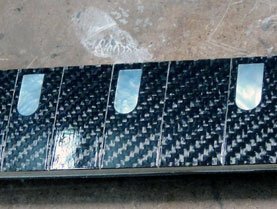 For the final prototype, the markers are inlaid Mother of Pearl with a motif reminiscent of reversed white-on-black pipe organ keys with small white LED dots in the middle. The truss-rod cover will also be Mother of Pearl. The Fret Markers. The motif is the reverse (white on black) pipe-organ keyboard. Zooming in a bit on the fret markers. Mother of Pearl is just so elegant! Testing the LED lights. 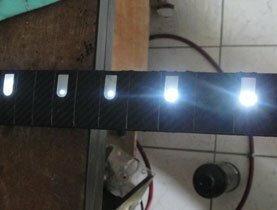 Small white LEDs are inlaid in the middle of each fret marker. The logo. The real thing looks even better than the original 3D rendering. Zooming in on the logo. The logo is hand crafted. For production, it might be better to have it cut using laser or water-jet. One more snapshot. The gloss is just to protect the inlay. We haven't even buffed yet. The final result will have a mirror finish! 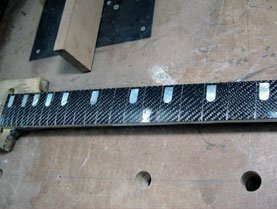 Shell inlays (not the cheap plastic substitutes) add value to an instrument. 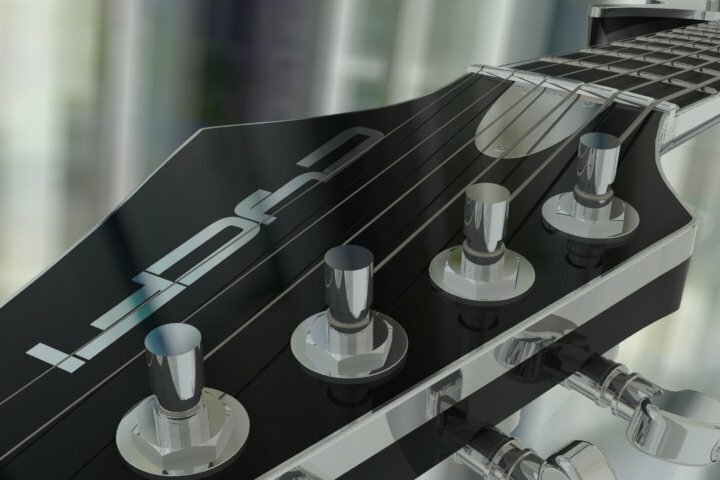 You can find real shell inlays only on priced high-end or custom-made instruments. Guitars endowed with shell inlays, from the simplest to the most elaborate, are works of art akin to fine jewelry. I’m not about to delve into the fine details of the craft but I’ll provide various links below that you can find useful if you want to get serious about this craft. You can also buy books on the subject. My favorite is the definitive bible of pearl work: “Pearl Inlay” book by James E. Patterson. While the art of inlaying has changed little over the centuries (the craft began in East Asia during the Tang dynasty), it is a lot easier now than it was before. Modern tools certainly made inlaying easier. 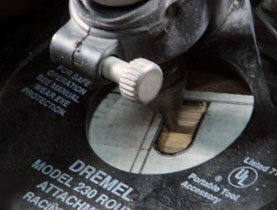 The versatile Dremel rotary tool is an indispensable tool for routing inlay cavities as well as for cutting, sanding, trimming and deburring shell pieces. 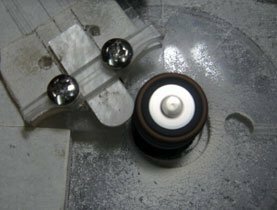 You can buy precision jeweler tools that are well suited for fine shell work such as the Jeweler’s Saw with fine blades from 35 teeth per inch (size 5) to 84 teeth per inch (size 8/0). If you do not want to go through the messy trouble of cutting and grinding the raw shells, you can also buy rough-cut shell blanks ready for cutting your design (that’s what I do) or even pre-cut shells for typical designs such as Les Paul square or trapezoid fret markers, dots, diamonds, etc. Finally, if you have access to laser or water jet cutting services, you can get extremely accurate results with minimum effort —simply draw the design using a vector drawing software such as Inkscape, Corel Draw or Adobe Illustrator. 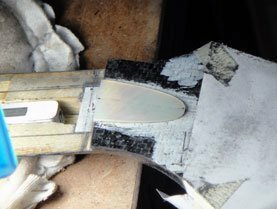 Skipping the laborious first step (preparing the blanks from raw shell), I start out with some nice Mother of Pearl blanks. You can buy either plain or figured blanks. There are various grades. Exhibition Grade is the most expensive. It is flawless in every respect with no discoloration, no wormholes, no growth fractures and no undesirable flaws. AAA Fancy Grade is like exhibition grade but with only one flawless side. A Grade is almost like AAA with one flawless side but with potentially small flaws that can easily be avoided. Standard Grade is the cheapest entry-level grade. I buy from an MOP supplier in ungraded bulk. I grade the blanks myself and choose only the highest grade. Some blanks may have rather nice features except for one or two flaws that can be avoided. For the prototype, I manually cut the logo using a Jeweler’s saw. For production, it might be better to have the shapes cut using laser or water-jet. For most of the work, a medium size blade will suffice. For more intricate curves, I use a finer blade, but I never had the need for sizes finer than 1/0. It takes time to master the use of the saw and it is perfectly normal to break a few blades before becoming proficient. So you know I love jigs. For cutting the shapes, I devised two jigs. For the fret markers, I needed a jig that will give me accurate and repeatable round corners. I built a jig with a small adjustable swinging clamp (see image below). The jig is positioned adjacent to a table mounted Dremel with a small drum sander. The distance from the pivot to the edge of the drum sander will be the round corner’s radius. The other jig is a standard sawboard for cutting the pearl blanks. You can easily construct this jig from plans provided in the links below, or the easy route: just buy one from StewMac. I built mine from plans I got from “Pearl Inlay” book by James E. Patterson (see picture at right). It is very similar to the one from StewMac. I use a small aquarium air pump and hose for the dust blower —a must if you want accurate results. Shaping the fret markers using a round corner shaping jig and the Dremel table-mounted. I use four routers: a 1500-Watt Makita 3600H for heavy routing, a 1200-Watt Ryobi ERT241200 plunge router for moderate routing, another 400-Watt Ryobi EVT400K trimmer router for light duty routing and trimming and finally, a Dremel rotary tool for precision routing. 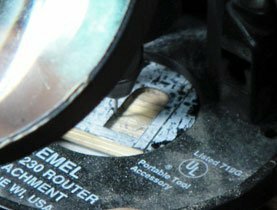 The Dremel is not just a router. It is such a versatile tool; indispensable for intricate work, including, but not limited to, routing. I love this tool! The Dremel is the perfect tool for routing out the inlay cavities. I use a Dremel router base and various small end-mill bits. I’m quite disappointed with the plastic Dremel router base. While it gets the job done, I’m not quite happy with the fine adjustment. I’d probably get a StewMac Precision Router Base soon or build one myself. To transfer the design to the material to be routed out, a thin layer of white water-based paint is first applied. 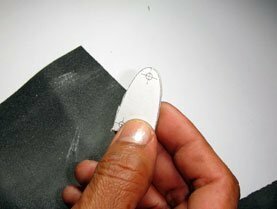 A fine point inlay scribe traces the shapes’ contours while holding the inlay pieces down. Smaller, more intricate parts may be temporarily glued down using spray adhesive. I start off with a 4-flute 3.18 mm (1/8″) solid carbide end-mill to cut larger chunks of material close to, but without touching the outline. I then finish with a fine solid carbide cutter tapered router bit. These bits taper from 0.48 mm (0.019″) to 0.8 mm (0.032″)) —perfect for fine inlay routing. The headstock painted with white water based paint and scribed with the inlay pattern. Routing the logo cavity. The small hose is connected to a small air pump to blow away dust. Cavity fully routed out with the logo. The layer of paint easily wipes off with a damp cloth. Gluing the inlay pieces with black epoxy. Making sure that excess glue is wiped off, the logo is now ready for leveling and sanding.